By Kori ~ November 3rd, 2010. In July, Paul Zitarelli of Full Pull Wines emailed an offering to his list that included two Washington Grenache, the 2008 Maison Bleue La Montagnette Grenache and the 2008 Chatter Creek Grenache. He noted that, â€œGrenache can be vinified in a full spectrum of styles, and today’s offering presents two ends of that spectrum. …the price points on these wines invite a comparative tasting.â€ Since I had not had either of these wines, I was intrigued. I ordered a bottle of each wine and put them into our private tasting lineup. Last week, we had what turned out to be this Washington Grenache showdown in one of our private tasting dinners. 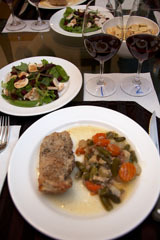 Both wines were good and paired well with our dinner of pork chops and vegetables in mushroom gravy and a mixed green salad. For a more complete description of how we set up these private tastings, please refer to How We Taste. Maison Bleue, founded by owner/winemaker Jon Martinez, is located in Prosser, Washington. Martinez changed careers to venture into winemaking, giving up a successful dental practice. While Maison Bleue is a relatively new winery, it is considered a rising star and has been the buzz of the Washington wine industry this year. Maison Bleue produces around 1,400 cases annually and is focused primarily on Rhone varieties. Chatter Creek, located in Woodinville, Washington, was founded by owner/winemaker Gordy Rawson in 1996. Rawson started out making wine as a hobby over 20 years ago. He went to work for Columbia Winery in 1987 and worked under the late David Lake, a Master of Wine. He left Columbia in 2000 to focus solely on Chatter Creek. Chatter Creekâ€™s annual production is approximately 2,200 cases and is focused on Rhone and Bordeaux varieties. This was a fun tasting. 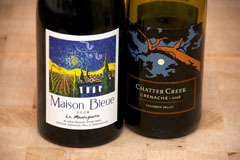 Both wines were good, and the Maison Bleue delivers the â€œmost bang for your buckâ€ as well. For those of you who have not had much, or any, varietally-labeled Grenache, I encourage you to give it a try. It is a good choice if you are looking for an alternative to Pinot Noir. 2008 Maison Bleue La Montagnette Grenache (Alder Ridge Vineyard, Horse Heaven Hills, Washington): 85% Grenache and 15% Syrah. Deep purple in color. Very aromatic with red fruits, raspberry, spice, oak, and a hint of buttered popcorn on the nose. Fruit-forward with raspberry, clove, and strawberry Twizzlers on the palate. Medium-bodied with crisp acidity and soft tannins. Well-balanced and smooth with a long finish. 2008 Chatter Creek Grenache (Columbia Valley, Washington): 85% Grenache, 10% Syrah, and 5% Mourvedre. Medium, ruby red in color. Aromatic with green vegetable and cherry Jolly Rancher aromas. Fruit-forward with red fruit, especially cherry and raspberry, on the palate. Light to medium-bodied with crisp acidity and low tannins. A bit watery and thin on the mid-palate with a medium to long finish. Could be mistaken for a Pinot Noir.